“Curiously, the impeachment comes just as the Supreme Court ruled on a sweeping and controversial poverty-alleviation bill. 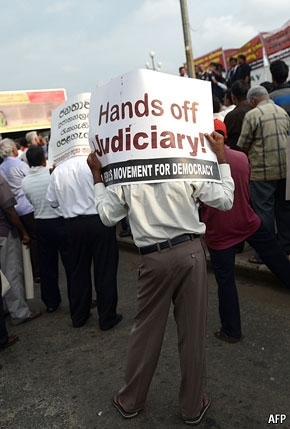 The ruling, handed down by a bench headed by Mrs Bandaranayake, held that parts of the government’s draft legislation were inconsistent with the constitution. It said that one clause, unless amended, required the approval of a national referendum. It was the second time the Supreme Court had blocked the bill. In September the court ruled that the country’s nine provincial councils needed to approve the bill before its enactment. Mr Rajapaksa was said to have been furious at such impudence.” the Economist. Now isn’t that what democracy and freedom to the people is all about?